Perennial lightweight contender Nate Diaz had plenty of words for UFC featherweight champion Conor McGregor after his win over Michael Johnson in December. Now on Saturday, March 5, the Stockton native will get to fight "The Notorious" one in the five-round main event of UFC 196 at the MGM Grand Garden Arena in Las Vegas, Nevada. The main event change came about on Tuesday, when McGregor's original opponent, UFC lightweight champion Rafael Dos Anjos, was forced out of the bout due to injury. Diaz agreed to step in for the bout against Dublin's McGregor, with the fight taking place at 170 pounds. 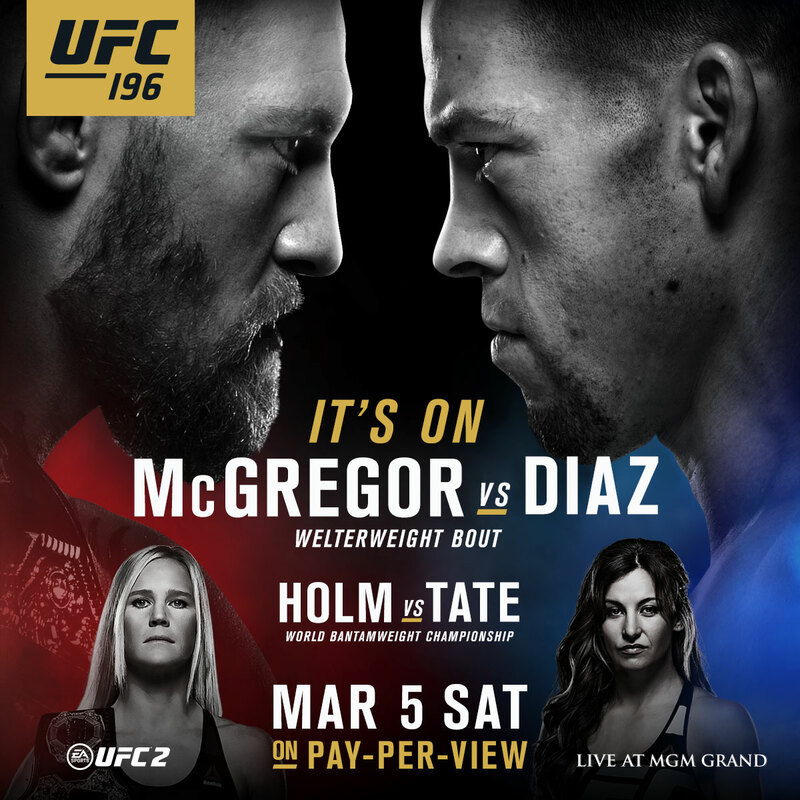 In the UFC 196 co-main event, women's bantamweight champion Holly Holm defends her title for the first time against Miesha Tate. Tickets are on sale now. McGregor has been calling his shots in the UFC since his debut in the promotion in 2013, and the man dubbed by many as “Mystic Mac” has been on target with his Ali-esque predictions. Sailing to the top of the featherweight division in the space of seven fights, the 27-year-old capped off his rise with 2015 knockouts of Dennis Siver and Chad Mendes, and a stunning 13-second finish of Jose Aldo. The 145-pound champion was seeking more gold at 155 pounds, but with Dos Anjos' injury, that fight will have to wait. Instead, McGregor gets to settle a score with Diaz. A former Ultimate Fighter winner who has been a member of the UFC roster since 2007, 30-year-old Nate Diaz has been thrilling fans at 155 and 170 pounds for years, with victories over Donald Cerrone, Takanori Gomi and Jim Miller, among others. Winner of two of his last three, Diaz knocked out Gray Maynard and decisioned "The Menace" Johnson to soar up to the number six spot in the lightweight rankings, and with a win over McGregor, he could put himself in the mix for a rematch against Dos Anjos.